We have lived here for 2.5 years and sometimes I feel like we haven’t done hardly anything to this house. That’s when I have to pull out some of the pictures that I took on the day that we signed the closing papers. This was taken in December, so it’s not quite as dramatic as I would like, but it gives you an idea. We took down the swing set and I began the transformation. I wanted to get the fire pit area out of the middle of the yard. 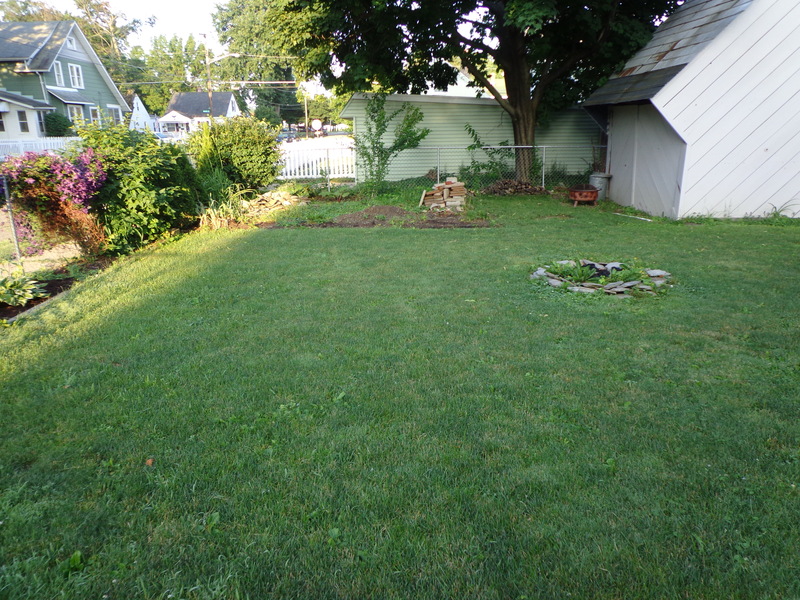 And I had this giant area of dirt and weeds that I didn’t want to really deal with every week. 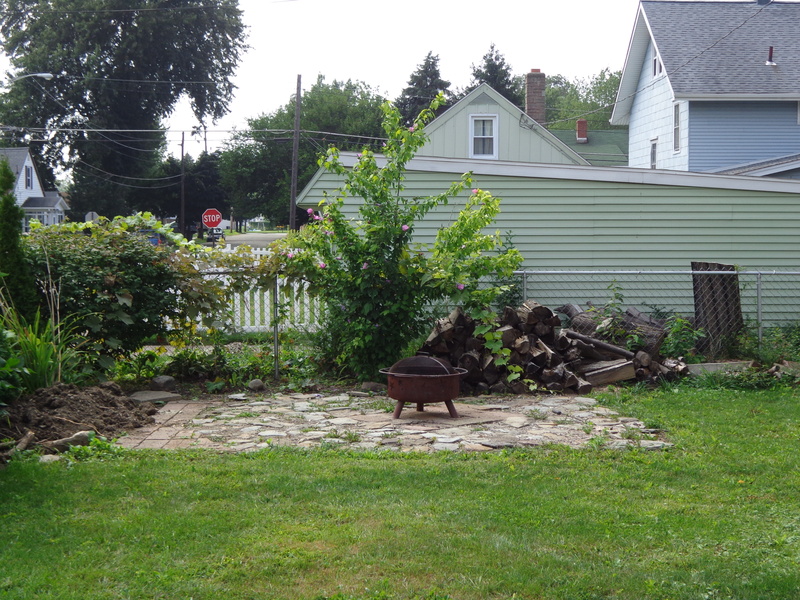 So I laid out pavers and we placed our fire pit over there. 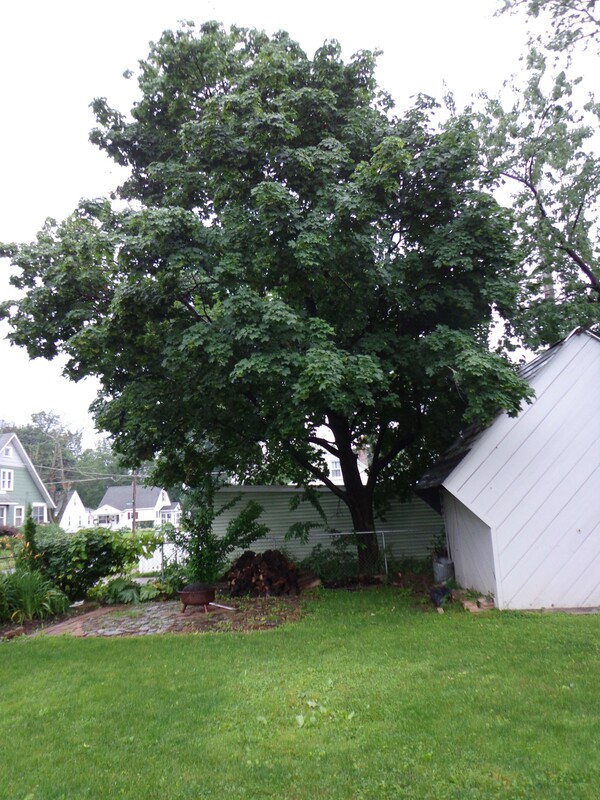 Except we had that giant maple tree that hung over our side of the fence. I don’t like maple trees because they are so dirty and they drop pollen all over everything. Considering I’m allergic to almost EVERYTHING that grows outside, having this monstrosity hanging over our property didn’t make me very happy. 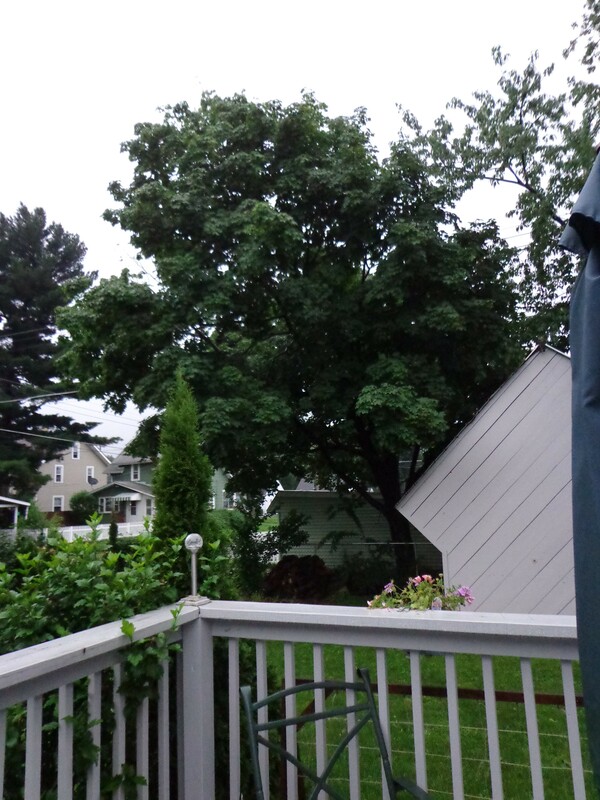 The lady who lives behind us, and technically owns the tree, came over and chatted with me one day. She asked me when did we have our half of the tree last trimmed? Our half of the tree?? I had always considered it to be COMPLETELY hers! I didn’t mention that, though, and began a discussion that ended up with us both agreeing that we would be happier if the whole thing was gone. This woman is retired and doesn’t have a whole lot of extra spending money so in order to get it taken down Jay and I agreed to pay half of the cost. Luckily the guy who was going to cut it down works with Jay so he gave us a fair price. It came down the weekend of July 4th. Yeah! It really opened up that end of the yard. 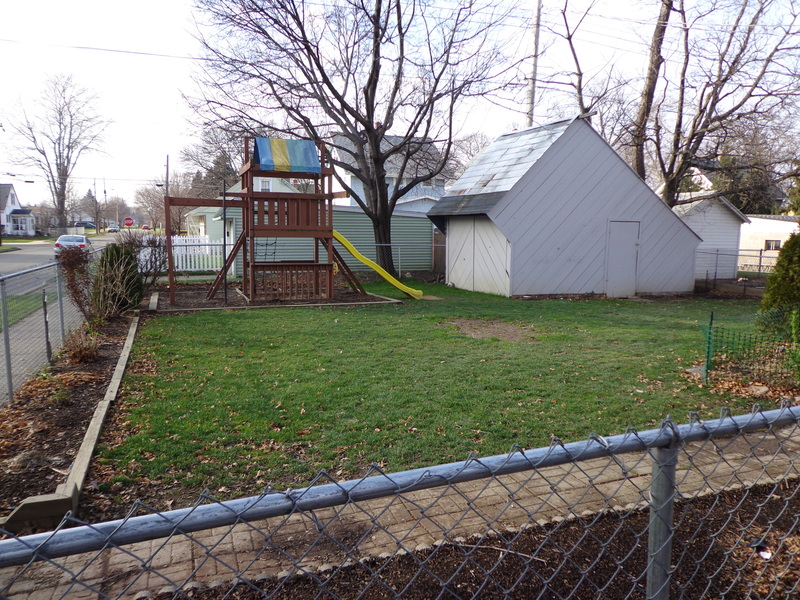 However, it also completely exposed our ugly shed. That will definitely have to be changed next year! Now our fire pit area is so much nicer. I have to figure out what to do with that stupid grape vine, though. The tree guy couldn’t cut the stump down more than that because as he was trying to cut it he discovered that it had grown around a metal post! The woman was fine with it because it at least gives her access to that part of her property and she wants to utilize it next year for growing vegetables or something. I just know that I’m so happy not having to worry about the mess that the tree created. 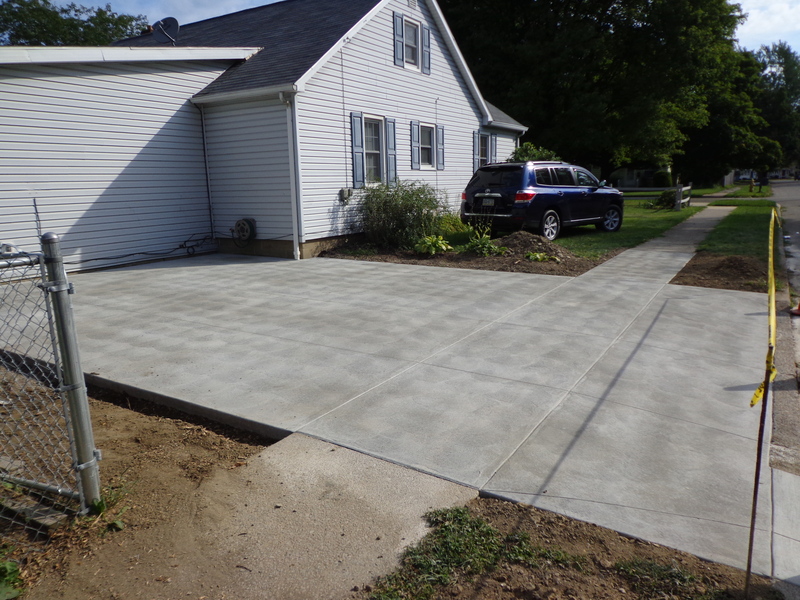 The other big transformation that we’ve done to the property is to widen the driveway and put in a concrete driveway. 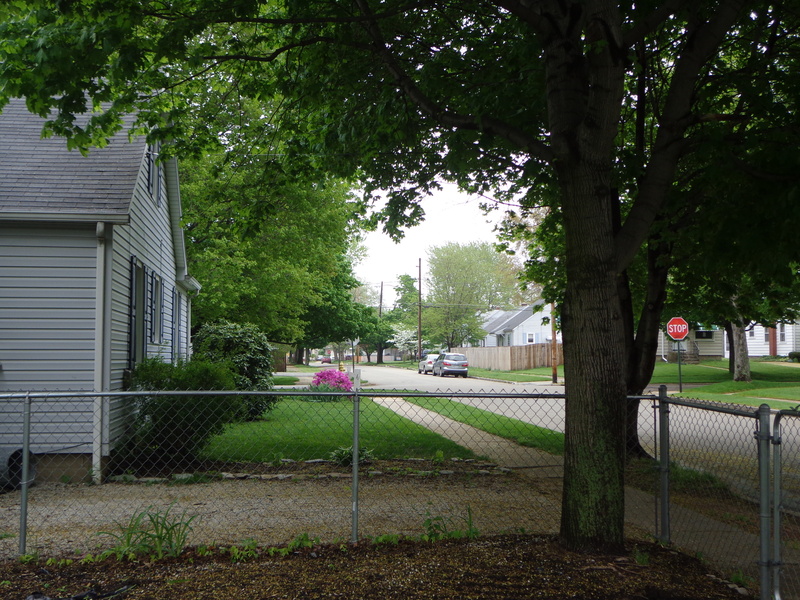 In this picture, though, you will notice that on the far side of the driveway they used to have a little flower garden of sorts that basically just contained a bunch of hostas. We put the driveway in, but left the garden on the far side. I really had no idea what I wanted to do with it. I like the giant bush in front of the window to deter people from trying to access the house via that route. This was what it looked like July 4th weekend. 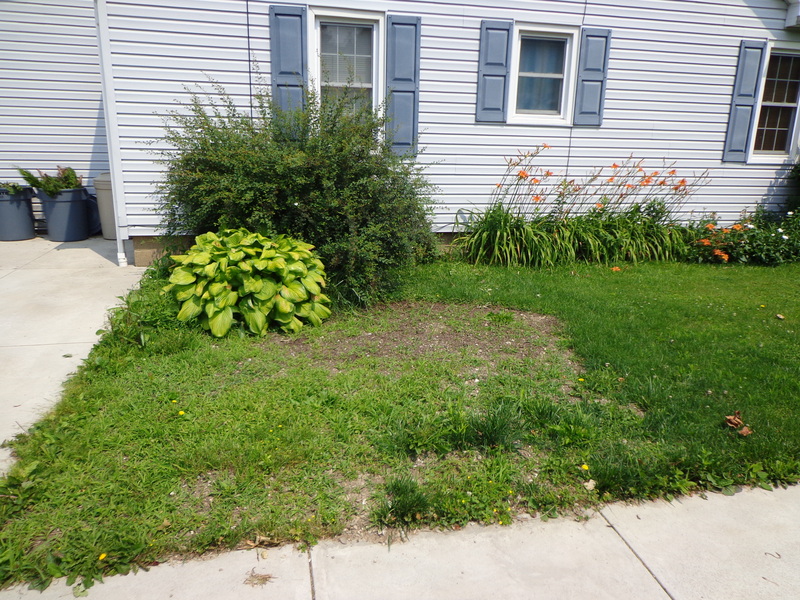 I had removed all of the hostas except that giant one and I had attempted to smooth out the dirt from where they had piled the dirt during the driveway renovation. Also, I’d had a big pile of mulch dumped there last year. I was tired of it looking trashy, though. 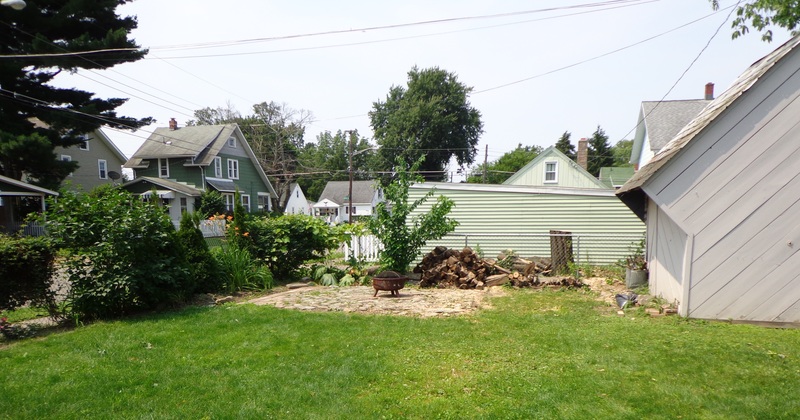 I ended up transplanting the hosta and moving it to the other side of the house. Then I didn’t know what else to do with that spot. 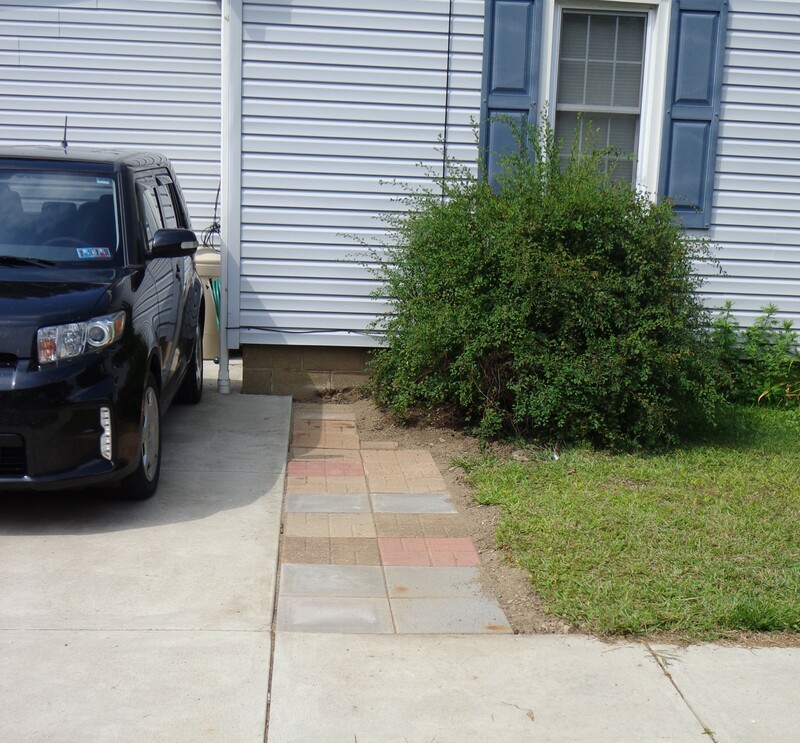 If you notice the stupid weeds grow up and start spreading over the driveway. That’s right where I park and even if Jay has just mowed and weed-wacked it’s not very long before I’m stepping on the weeds again. That really tends to irritate the snot out of me. Jay and I discussed what to do with this area (even though he claims that he doesn’t remember the conversation at all). What do you think? This past weekend Jay had to work on Saturday, so at 9:30 I was outside getting this prepared. I didn’t do it correctly as I didn’t have enough sand to lay down before putting the pavers in. These were left over from when we did the sidewalk that goes up to the deck. 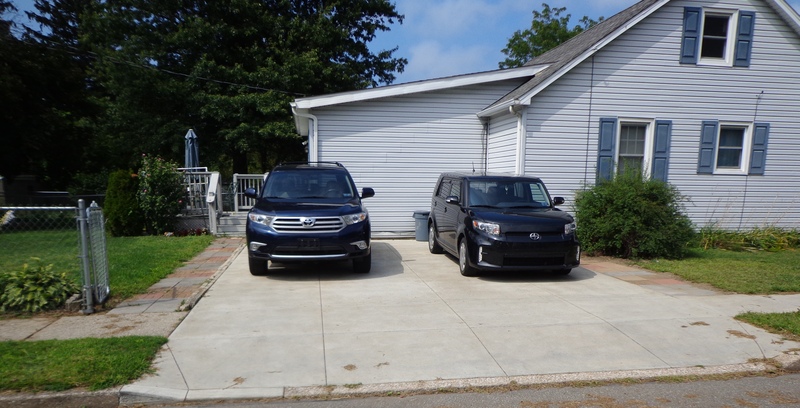 I tried to do it to match the sidewalk on the other side of the driveway. It’s not even, but I don’t care. I don’t intend to do a lot of walking on it. I just wanted it to be easier to keep the weeds from encroaching on my car. Also, it should give me a little more room in the winter when Jay cleans off the driveway. Don’t worry. It might look like I’m trying to get rid of everything that grows around here, but I’m not. 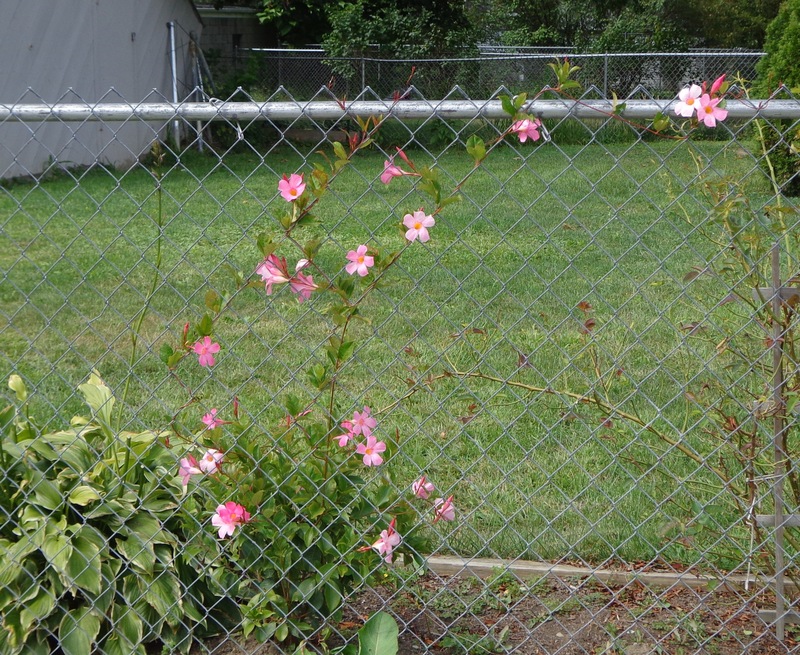 In fact, here’s a flowering climbing plant that I planted earlier this spring. I can’t recall what the name of it is, but I’m so happy that it is finally twining itself onto the fence. Isn’t it pretty? This entry was posted in Garden, My House, Roses and tagged flowers, Garden, My House, Roses, yard work. Bookmark the permalink.